But it was all downhill from there for over a hundred pages. That’s a long way to wade through a book, but my interest was piqued enough to keep going and in the end I was glad. Mostly because of the soppy romantic bits, which I got quite caught up in, in spite of my better judgment. You can tell this is a bit of tribute to Charlotte Bronte’s family, Branwell, Emily and Anne all died as she was writing this — I can’t even imagine how terrible that must have been. Shirley’s character and romance reminded me of Wuthering Heights, though I confess it is forever and a day since I read — and quite disliked — that book. So I suppose Caroline is more Anne’s style, and I am sad I haven’t read her yet. I will amend it. It was a curious read, curious to feel an affinity in most things with the heroines and the narration (after that first dragging 100 pages and despite all the colons). They are lively and strong and say what they think and think deeply, though in very different styles. They love woods and wilds and hidden places and poetry and are kind and hate polite company without taste or understanding. But over and over again I stumbled over the ways that the hierarchies of their time’s beliefs around gender and class had deformed them. 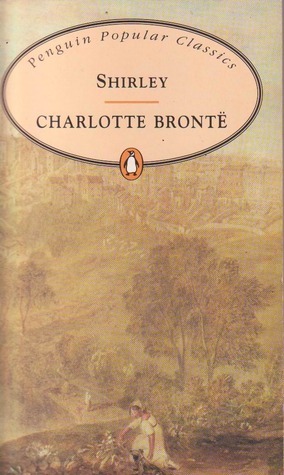 Charlotte Bronte does more in this novel than the others to explore the broader contours of society, the conflicts of the times, it sets her characters against their context, and that makes it harder for me to bear them. There is such a gulf between us, it is the clear gulf between rich and poor, between rulers and ruled. I am afraid I have mostly pulled out the quotes that illustrate this — and the casual attitudes of Empire. It is a fascinating glimpse into those who celebrated the early heroism of capitalism — if only it were tinged with the paternal care that characterised (possibly, I myself am dubious) aristocracy at its best — but that’s what women are for in this novel. Moore ever wanted to push on: ‘Forward’ was the device stamped upon his soul; but poverty curbed him: sometimes (figuratively) he foamed at the mouth when the reins were drawn very tight. I think the most revealing sentence is this one describing a conversation between the heiress Shirley Keeldar and Caroline about Shirley’s project of charity amongst the workers. Her goal is to reduce the danger to mill-owner Robert Moore through relieving the poverty of the unemployed enough to relieve their desperation. They have been shooting mill-owners, burning things down, destroying things. The novel is set in 1811-1812, the height of the Luddite rebellion against the new machines being introduced into Yorkshire mills, making employment even harder to come by though almost everyone is out of work. The war against Napoleon and a ban on exportation of cloth to the continent meant that cloth is piling up, and mass unemployment had brought starvation. Shirley is happy to do good works, but let the beneficiaries once challenge her and she will remind them of their place — this despite the fact that in the novel their plea is always work enough for them to feed their families honorably. Such demands and violence against machinery hardly seems such a terrible thing when people’s children are starving. Thus, while Caroline and Shirley converse kindly and happily with the best of the workers, they must know to yield to their privilege. Workers must accept their lower position, be grateful for friendships and petition for charity rather than demand respect or work or food for their starving children. If they come together in groups of more than one or two, they become the mob. I found the references to class so revealing, the fear of working men’s rioting so deep and combined with such anger at their presumption. This is the birth of capitalism we are watching, of industrialisation as well as the early resistance against it. Like now, the risings are also always blamed on outsiders, rabble-rousers leading good men who know their place astray. The connection with religion is telling here too, for they are all dissenters — which also somehow connects to their ranting and their alcoholism. There is an amazing scene where the procession of schoolchildren from the Church of England charity school meets with a procession of dissenters and immediately there is a fight — the battle of Royd-lane. The Church of England sends them running, and all is well with the world. What better things for decent folk to spend their money on. Ugh. There is more of course. Indians are beneath even Yorkshire workmen and dissenters. But here we have emigration as escape for failed mill owners. Romantic ideas of frontier and new lands to conquer. And for all this I enjoyed the novel, and parts of it were most touching. It particularly struck me how terrible the lot of women was during these times, when marriage was all there was. There is a long section where Caroline almost dies, essentially of a broken heart and depression at a future empty of love or usefulness. As part of her trying to pick herself up out of this, she visits two known ‘old maids’ mocked and disliked for their ugliness and solitary state. She finds unknown depths to them… The tragedy of intelligent and bright women facing an uncertain future given a lack of dowry. I picked this up off a shelf at the farm in an attempt to move beyond my usual reading just as I was doing with farming — though possibly I should have read Lee Child instead. Completed in all its length amidst the delights of Gloucestershire rather than Yorkshire, it was still a good companion read.